I was talking with my class recently about how there are so many different ‘versions’ of the Gospel. If you look around hard enough, you’ll find someone preaching from the Bible whatever it is that you want to hear from it! 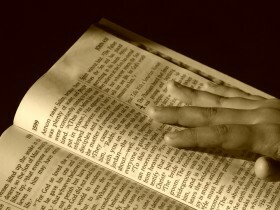 At the root of this problem is the idea that most Christians are not very skilled in the techniques of Bible exegesis and hermeneutics. The result is that people can literally make the Bible mean whatever they want, and that is a really bad thing! But it is important to understand that the text of the Bible contains one truth, not many different truths depending on how one chooses to interpret it. One of the keys of good exegesis is to understand what the writer’s message was to it’s original audience. Before we can turly understand what God’s Word is to us today, we must first understand the text the way the original audience would have heard it. We must look back into what life would have been like in the first century. Understanding the details of the culture in which the events of the Bible happened is one of the greatest keys to finding real truth within its pages. For me personally, one of the most exciting things about being a Christian is discovering the clues that unlock the true meanings in the Message! I find few things as exciting and liberating as truth revealed! In this group blogging project, we will be working through a great resource that does this very thing! Each contributor in this project will share their thoughts on a chapter of the book as Gary Burge shares historical insights that will help us better understand the time and culture of the people that would have lived these stories. So this project will be a little different in nature than some of the other projects that we do here. This one is more like a small group Bible study! So it is my prayer that the contextual insights into these Biblical texts will bless you, challenge you, and excite you! I pray that this project will open your heart and your mind, and that a greater hunger for the Word of God burns deep inside of you. So please join us in this exciting journey, and feel free to share your thoughts as we explore some of the great stories from Jesus, The Middle Eastern Storyteller! Hey Dan…great points in the intro!! It is true what you said about people being able to take away from the Bible what they want because they read it from their own point of view..not that of the author, much less God's. The more I interact with people who live in our community around our church in in the county around, the more I find large numbers of people who are fundamentally Biblically illiterate and know practically nothing about the Bible…including people who claim a church background. If we want the “church” to return to the former glory that God had given it, then we must return to helping people understand the Bible for themselves, but also to do it correctly. I find that my friends who belong to other “faiths” apart from orthodox Christianity are especially prone to this problem since they rely upon boards, counsels and priesthoods to tell them what the truths of God are and how to apply them. This issue of biblical illiteracy is (I believe) one of the biggest problems in the church today. What makes it worse is that sometimes non-Christians know the Word better than Christians. I really appreciate your thoughts and perspective here, and I agree that the call to return to helping people understand the Word for themselves is one of the keys to returning to that glory! I am also looking forward to this project! I look forward to hearing your thoughts as we dive in!